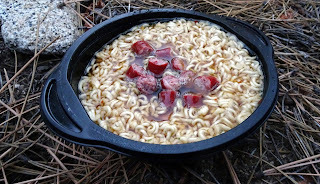 A female backpacker and friend sent me an e-mail about calories and hiking. She had been having problems with eating too little on her trips and felt other women were having similar problems. So she wondered if I could answer some questions she had. I said I would give it a try. One of my most common arguments for a light packweight is: If the stuff you HAVE to bring is as light as possible (without losing functionality) this gives you a chance to bring more of the stuff you WANT to bring. This could be camera or climbing equipment. Or a bottle of wine. Or perhaps fresh food. 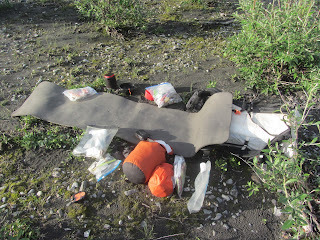 Two bear proof cans with two weeks of food that was flown into my resupply during a month long hike through the Brooks Range of northern Alaska. Backpacking is a leisure activity that is meant to be enjoyed. If you eat too little to keep your blood sugar at comfortable levels, you will not have much fun. 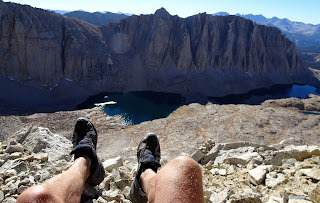 Fellow hikers will not enjoy you much either.You will become grumpy and running the risk that poorer judgement will land you in potentially dangerous situations. Once there you might not be able see the best way out. Food is fuel for the body, it not only propels you forward, but also helps you maintain your body temperature. It contains the energy you need in order both to live and to enjoy life. Hypothermia, with the risk of freezing to death, is more of a problem in wet weather just above freezing than in ten below winther weather. Increasing apathy is a often consequence of not eating enough. The road to hypothermia goes via increasing apathy. Lack of calories is one component here. So trying to save weight in your pack by bringing less food is as clever as trying to save weight on your car trip by bringing less gasoline. How many calories per day does moderate backpacking burn? What are the daily requirements? As usual the reply will be: It depends. Even if there are also individual aspects, however, some generalizations are valuable. Women need less calories than men. Small individuals need less calories than big and old ones need less than young. Looking at the situation, hiking uphill craves more calories than hiking downhill, hikings fast more calories than slow, hiking with a heavy load versus hiking with a ligth pack the same. Low temperatures are also more energy consuming than high. Lunch break along a river bed in Brooks Range. The perhaps most important factor influencing your energy needs is probably how many hours per day you (actually) hike. Getting out of camp around 9 am into camp around 5 pm will of course mean less energy expenditure than hitting the trail av 6 am and getting into camp at 9 pm. There are different ways of calculating these things and personally I stay away from the decimals. Usually we end up with some averages that indicate that men need 3500-5000 kcals and females 2500-4000 kcals for a day of backpacking. 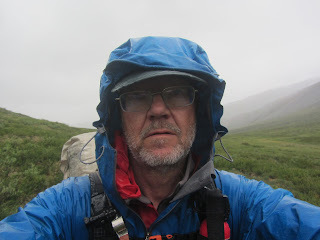 If you are a sturdy male speed hiker doing really big mileages this will not be enough. I am not one of those and I know that my daily intake of 3200 kalories usually do not let me lose more than a 2-4 pounds/1-2 kilos during a week or two of hiking. I feel pretty satisfied with that and belive I have a good balance between input and output. What I suggest you do, dear reader, is to put yourself in the kcal/per day framework above. Are you closer to 2500 kcals that to 5000 kcals? Make a rough guess, this is not rocket science, just some rules of thumb. My hiking method is one of hiking for about 50 minutes and taking a break for ten minutes. Sometimes more if company is good. Less if I am alone in the rain. But I always take these breaks (which are more important in inclement weather IMHO, but that is another story). During the breaks I snack and drink water. So my calorie intake is spread out during the day, with the biggest meal when I need it the most, around noon. As a consequence I am never, honestly, exhausted, depressed or churlish (hiking mates might disagree on that last one...). Part 2 of this blog entry about energy will look at how I pack these calories and how much they do weigh.